Several extracellular heparin-binding proteins involved in regulation of growth and differentiation belong to a new family of growth factors. 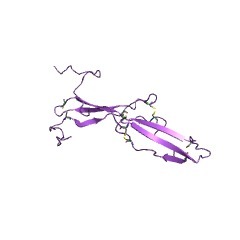 These growth factors are highly related proteins of about 140 amino acids that contain 10 conserved cysteines probably involved in disulphide bonds, and include pleiotrophin [(PUBMED:15121180)] (also known as heparin-binding growth-associated molecule HB-GAM, heparin-binding growth factor 8 HBGF-8, heparin-binding neutrophic factor HBNF and osteoblast specific protein OSF-1); midkine (MK) [(PUBMED:15047154)]; retinoic acid-induced heparin-binding protein (RIHB) [(PUBMED:7796887)]; and pleiotrophic factors alpha-1and -2 and beta-1 and -2 from Xenopus laevis, the homologues of midkine and pleiotrophin respectively. Pleiotrophin is a heparin-binding protein that has neurotrophic activity and has mitogenic activity towards fibroblasts. It is highly expressed in brain and uterus tissues, but is also found in gut, muscle and skin. It is thought to possess an important brain-specific function. Midkine is a regulator of differentiation whose expression is regulated by retinoic acid, and, like pleiotrophin, is a heparin-binding growth/differentiation factor that acts on fibroblasts and nerve cells. There are 691 PTN domains in 689 proteins in SMART's nrdb database. Taxonomic distribution of proteins containing PTN domain. This tree includes only several representative species. The complete taxonomic breakdown of all proteins with PTN domain is also avaliable. Click on the protein counts, or double click on taxonomic names to display all proteins containing PTN domain in the selected taxonomic class. Solution structure of midkine, a new heparin-binding growth factor. Midkine (MK) is a 13 kDa heparin-binding polypeptide which enhances neurite outgrowth, neuronal cell survival and plasminogen activator activity. MK is structurally divided into two domains, and most of the biological activities are located on the C-terminal domain. The solution structures of the two domains were determined by NMR. Both domains consist of three antiparallel beta-strands, but the C-terminal domain has a long flexible hairpin loop where a heparin-binding consensus sequence is located. Basic residues on the beta-sheet of the C-terminal domain form another heparin-binding site. Measurement of NMR signals in the presence of a heparin oligosaccharides verified that multiple amino acids in the two sites participated in heparin binding. The MK dimer has been shown to be the active form, giving signals to endothelial cells and probably to neuronal cells. We present a head-to-head dimer model of MK. 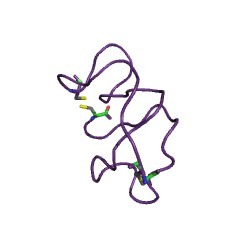 The model was supported by the results of cross-linking experiments using transglutaminase. The dimer has a fused heparin-binding site at the dimer interface of the C-terminal domain, and the heparin-binding sites on MK fit the sulfate group clusters on heparin. These features are consistent with the proposed stronger heparin-binding activity and biological activity of the dimer. Cloning and expression of a developmentally regulated protein that induces mitogenic and neurite outgrowth activity. 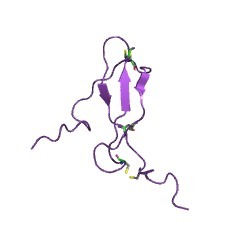 A heparin binding mitogenic protein isolated from bovine uterus shares NH2-terminal amino acid sequence with a protein isolated from newborn rat brain. The cDNA's of the bovine, human, and rat genes have been isolated and encode extraordinarily conserved proteins unrelated to known growth or neurotrophic factors, although identity of nearly 50 percent has been found with the predicted sequence of a retinoic acid induced transcript in differentiating mouse embryonal carcinoma cells. Lysates of COS-7 cells transiently expressing this protein were mitogenic for NRK cells and initiated neurite outgrowth from mixed cultures of embryonic rat brain cells. 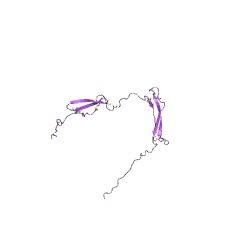 RNA transcripts encoding this protein were widely distributed in tissues and were developmentally regulated. This protein, previously designated as heparin binding growth factor (HBGF)-8, is now renamed pleiotrophin (PTN) to reflect its diverse activities. PTN may be the first member of a family of developmentally regulated cytokines.